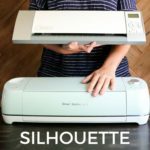 Silhouette vs. Cricut? 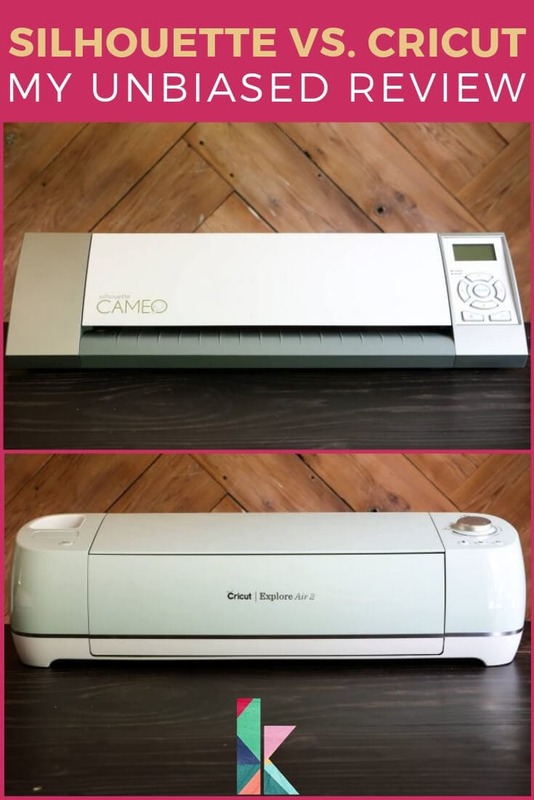 Learn the pros & cons of the Silhouette Cameo vs. Cricut Explore and decide once & for all which cutting machine is best for you! Hey friends! Today I am doing something a little bit different because I've gotten a lot of questions about cutting machines lately. 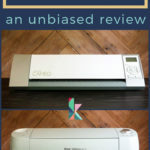 I'm going to give you my 100% unbiased review of Silhouette vs. Cricut cutting machines. Now, I always share my honest opinions even in sponsored posts, but to eliminate ANY DOUBT, I have chosen to write this post as an unsponsored post. Neither company is compensating me in any way to write this post, nor would I want them to. I want everyone to be able to read this completely unbiased post and decide which cutting machine is best for them, because the answer may not be the same for everyone! Now, I do need to tell you that I was given both machines free of charge to try out, but since they were BOTH free, that has not impacted my opinions. And you can see that I have absolutely used both machines over the years (click here to check out all of my Cricut and Silhouette projects). As you read this post keep in mind that you need to consider both the cutting machine itself AND the design software that you will use with the machine. Both are important! This post does include affiliate links to both machines for your convenience (which means if you make a purchase after clicking a link I will earn a small commission which helps keep my blog up and running but it won't cost you a penny more)! Click here to read my full disclosure policy. But by including affiliate links to both products, I again have no financial motivation for encouraging you to buy one or the other. 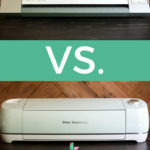 Silhouette vs. Cricut: Which Cutting Machine is Right for You? Let's start with the Silhouette Cameo in this Silhouette vs. Cricut debate, because it is the first cutting machine I got several years ago. I have to admit, I fell in love with it immediately because it could do things SO much faster than I could with scissors or an exacto knife, and it was just generally an exciting new DIY tool that I had never had access to before. I was able to make signs, vinyl decals, cards, gift tags and more. I was PUMPED. Now, my Silhouette Cameo often resulted in project FAILS and I've wasted more vinyl than I care to add up because I would be appalled by how much money I have wasted as a result, but I really, truly thought that was just the nature of cutting machines. I shrugged it off and accepted that all cutting machines probably have glitches and slip sometimes, but it was still super frustrating. How easy is the Silhouette design software to use? I was surprised that I found the Silhouette Studio software easy to use, because a lot of people think it's super confusing. I found it to be a powerful software that allowed me to either buy or create my own designs from scratch. But note, if you want to use your own .svg files, you will have to pay to upgrade the software to the “Designer” version (I believe it costs $50 to upgrade). That said, most people will be just fine with the free software and will find that there are tons of great images in the library to purchase at very low prices. I personally find that the images available in Silhouette Studio are a bit more professional looking than those in the Cricut Design Space, though I think Cricut is definitely catching up to Silhouette Studio in that regard. You can also easily type on a curved path in Silhouette Studio–presently that feature is lacking in Cricut Design Space. I should also mention that you have to download the software onto your computer, whereas the Cricut Design Space is a web-based program. Bottom line… If you have graphic design experience, then you will love the freedom that comes with this software. If you aren’t experienced in graphic design and are not interested in starting designs from scratch, you will likely find the software frustrating. You can watch the video below for a peek inside the Silhouette Studio. How well does the Silhouette Cameo machine cut? Depends on what kind of mood your machine is in :) All kidding aside, I found that I got unpredictable results when cutting with my Silhouette Cameo. I encountered most of my issues when cutting long lengths of vinyl, which is supposed to be one of the BEST features of a Silhouette. You see, Silhouette encourages users to load vinyl up to 10 feet long into their cutting machine without a cutting mat. And that is a super, super cool idea in theory, right? I mean, you can create a huge design and produce it by only loading your vinyl once and sending through one cut job?! Sounds great, but it just doesn't work that way. First of all, it's darn near impossible to easily load vinyl directly into the Silhouette Cameo. Because the vinyl comes in a roll, the end that you need to load is by definition curled under, which causes it to easily and repeatedly jam while you are trying to load it. Even if you can manage to get it loaded on the first try, you almost always have to manually straighten it. But the biggest problem is that the vinyl slips during cutting even when your rollers are correctly positioned and you have followed all directions perfectly. Y'all, I can't tell you how disappointing it is to unload a 6 foot length of vinyl only to discover that it slipped during cutting. When it slips, your cut lines get all wonky and your cut job is ruined. Wasted time. Wasted vinyl. Wasted money. It's not fun. 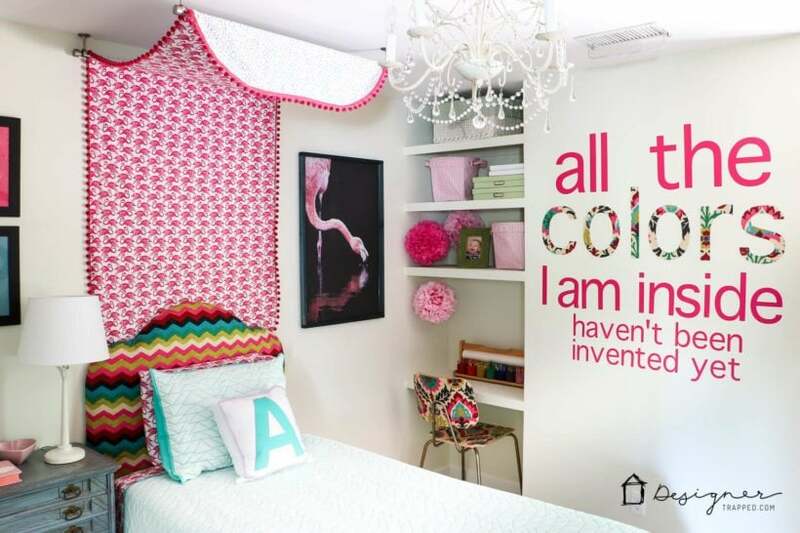 When I created this huge quote wall for my twin girls' old room, I wasted at least 3 entire rolls of vinyl because of the slipping issue. I was nearly in tears at one point. In fairness, I never had issues cutting card stock with the Silhouette Cameo, but my experience with cutting vinyl with it was not great. Now, I don't have the Silhouette Cameo 3 (the current version), so maybe there are some improvements that have been made, but from talking with other friends who do have the current version, it sounds like the slipping and trouble loading that I had are issues that persist. How strong is the Silhouette Cameo and what kind of materials can it cut? What is the cost of a Silhouette Cameo? The Silhouette Cameo retails for $299. You can sometimes find it on sale. 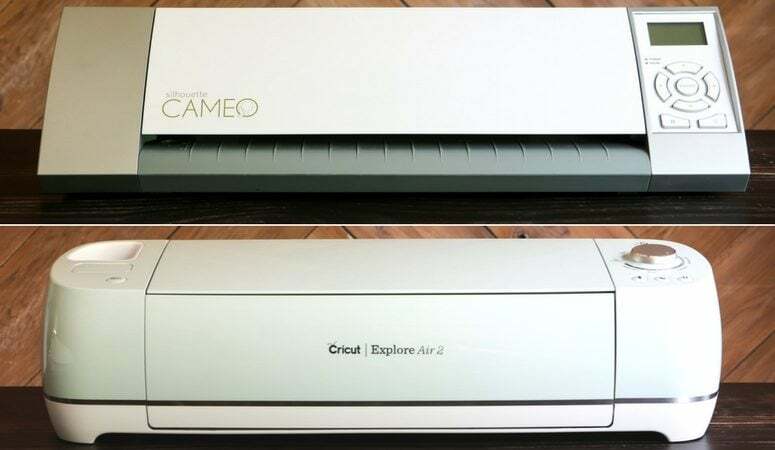 Next up is the Cricut Explore, which I've only had a couple of months, but have used quite a bit. 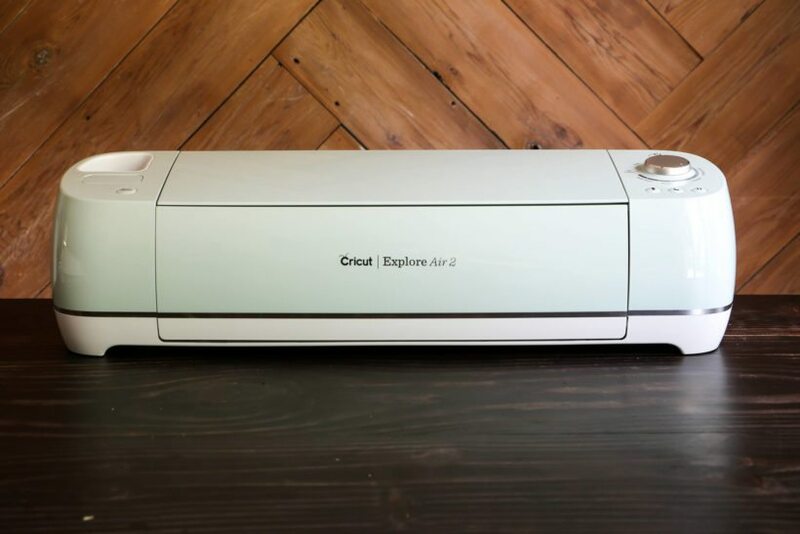 I have the Cricut Explore Air 2, but there are several different Cricut Explore machines to choose from. I had NEVER used a Cricut before and since I entered the wonderful world of cutting machines with a Silhouette, I figured I would never be converted. That's just kind of my personality when it comes to technology and cars. I get super comfortable with what I am using and really, really, really resist change. So, to say I was skeptical when I opened up my Cricut Explore machine is an understatement. But y'all, I was immediately intrigued. For starters, the Cricut Explore itself feels much more substantial and sturdier than the Silhouette Cameo. The lid on the Cameo isn't secure, so it kind of flops around when you move it. 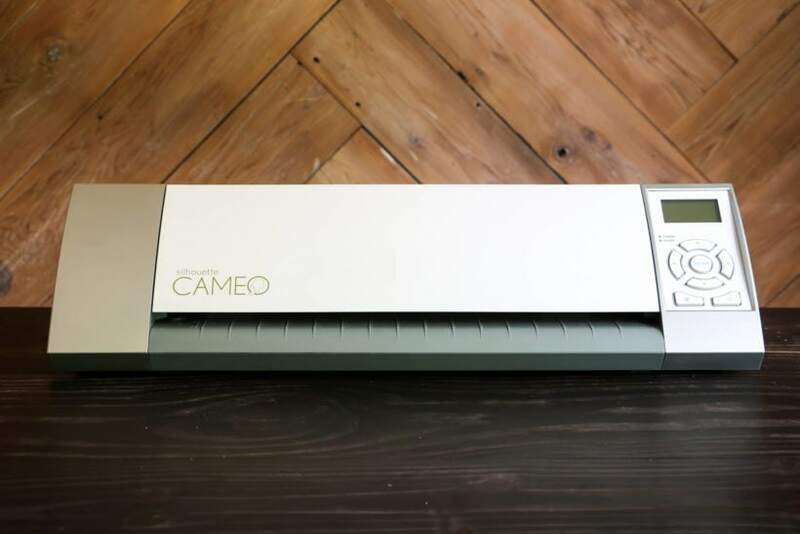 But more importantly, the machine belts that are so crucial to the operation of the Silhouette Cameo are almost impossible not to touch when you pick your machine up to move it. So I was ALWAYS worried about breaking my Silhouette Cameo. I immediately felt less paranoid about my Cricut Explore. Now, let me answer the most common questions I get about Cricut cutting machines. Don't you have to have cartridges that are sold separately to cut with a Cricut? No, no, no! I thought that, too, which is one of the reasons I went with a Silhouette machine to begin with. But no, that was true like 4 years ago, but is no longer the case. You can create your own designs, upload images, purchase design components, etc. in Cricut Design Space, so in that regard, it works just like a Silhouette. Is it true you can't upload your own images to the Cricut Design Space? Nope! Apparently this is a nasty rumor that was really never true. You can upload your custom designs and images into Cricut Design Space. It's easy, and unlike Silhouette Studio, you don't have to pay to upgrade your software to have the capability of uploading your own .svg files. How well does the Cricut Explore machine cut? Like. A. Dream. Seriously, y'all. The Cricut Explore shocked me. The cuts are quieter, faster and so much cleaner. I didn't realize how often I had to clean up the edges of my Silhouette cuts until I used my Cricut Explore. I find the cuts on all materials I have used it on so far (card stock, vinyl and chip board) to be perfect. I really was shocked by the difference in the precision of the cuts between my Cricut vs. Silhouette. Now, as we discussed above, you can cut lengths of up to 10 feet using a Silhouette Cameo (both machines cut materials up to 12″ wide). But with the Cricut, you can only cut materials up to 2 feet long. AND you have to use a cutting mat to cut vinyl. Initially, I was super bummed and viewed this as a huge drawback. But then I cut my first large vinyl project using my Cricut Explore and now I get it. I get why you should only WANT to cut vinyl with a mat and in sections only 2 feet long at a time. 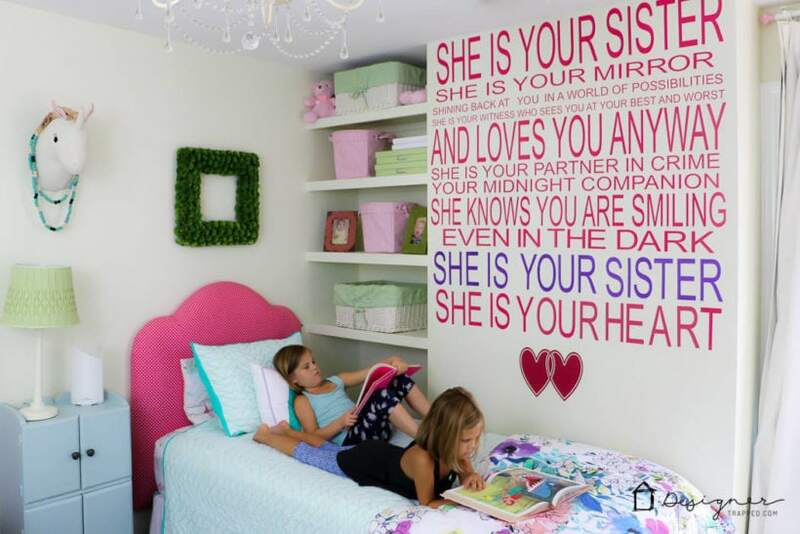 Here's a photo of the wall decals I made for what is now my daughter Attley's room (we separated our twin girls' bedrooms a few months ago). Yep, it's the same wall where the other wall decal was, but this time I cut it with my Cricut Explore. I didn't waste even one inch of vinyl this time around! Woo hoo! Better yet, I used my Cricut to cut the word “colors” out of chipboard and then coated them with fabric and mod podge and am so happy with how they turned out (you can find the tutorial here). How easy is the Cricut design software to use? I'll admit… It was really hard for me to get used to the Cricut design software. I'm not sure if it's because I was so used to the Silhouette Studio, but I did get a little frustrated when I first started using Cricut Design Space. One of the frustrations came from the fact that it relied on Adobe Flash, but fortunately the brand new Design Space has eliminated that issue! YAY! That said, MOST PEOPLE find the Cricut Design Space software is easier and more simple to use compared to Silhouette Studio software. And I think if I had started in Cricut Design Space, I would agree. But I was so used to Silhouette Studio (and you know the saying… It's hard to teach an old dog new tricks) I found it a bit challenging. Now that I've gotten used to it, I do find it easy to use and think it's perfect for users who want to create simple designs and won’t be creating custom designs from scratch. Don't get me wrong, you can create custom designs using the Cricut software, but your options are much more limited than they are in Silhouette Studio. But bear in mind that the Cricut Design Space was designed for importing existing designs created in other graphic design programs into the Cricut software. In other words, Cricut Design Space wasn't really created for graphic designers. It was created for creative consumers. So, I have no issue creating my custom designs in Adobe Illustrator and importing them into Cricut Design Space. 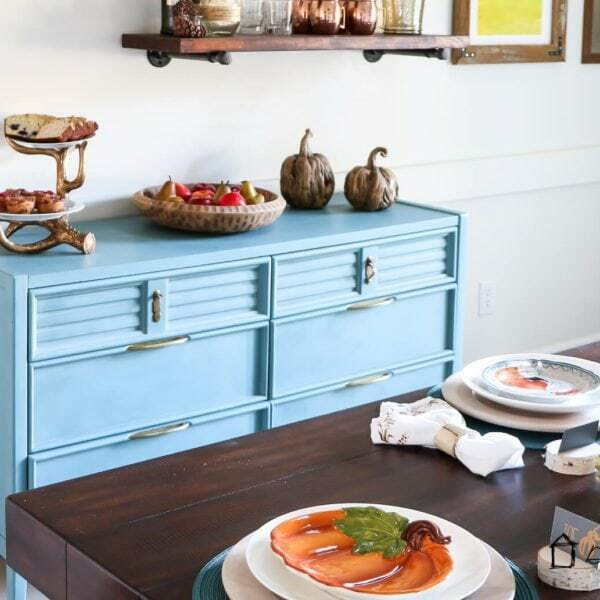 It is super important to know that the Cricut Design Space requires an internet connection since it is a web-based program, and that projects and linked cartridges are stored in the cloud. So if you are without internet access, you won't be able to use your machine. Take a look at the video below for a peek into the Cricut Design Space. 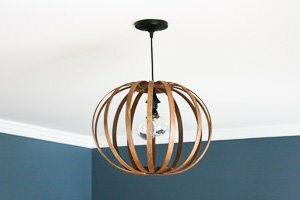 What is the cost of a Cricut Explore? 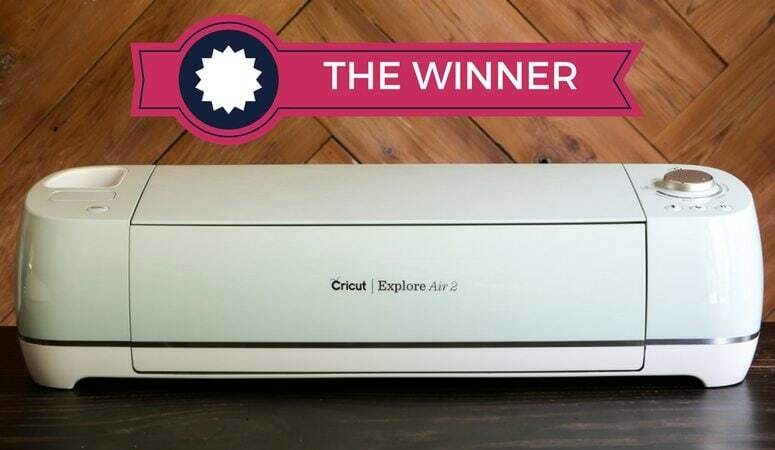 The Cricut Explore Air 2 (which is the machine I have) retails for $299. You can sometimes find it on sale. For me, the clear winner is the Cricut Explore, especially now that I have gotten used to the Cricut Design Space. The machine is sturdier, stronger and performs better. And for the vast majority of users, Cricut Design Space is far more user friendly and will fit their needs perfectly. The only time I an imagine recommend a Silhouette to someone over a Cricut is if they want to create custom designs AND do not have access to external design software (like Adobe Illustrator, Photoshop, InDesign, etc.). That is going to be a teeny, tiny percentage of users and they may have to settle for a sub-par cutting machine in order to meet their design software needs. That said, I find that most people who like to design graphics (myself included) already use external software (I use Illustrator), making the best option Cricut Design Space since you can upload custom .svg files without having to pay to upgrade software. So if you really want to be able to create designs from scratch AND you want the best machine, I'd recommend using an external design software so that you can upload your custom designs into the Cricut Design Space. That's really the best of all worlds! 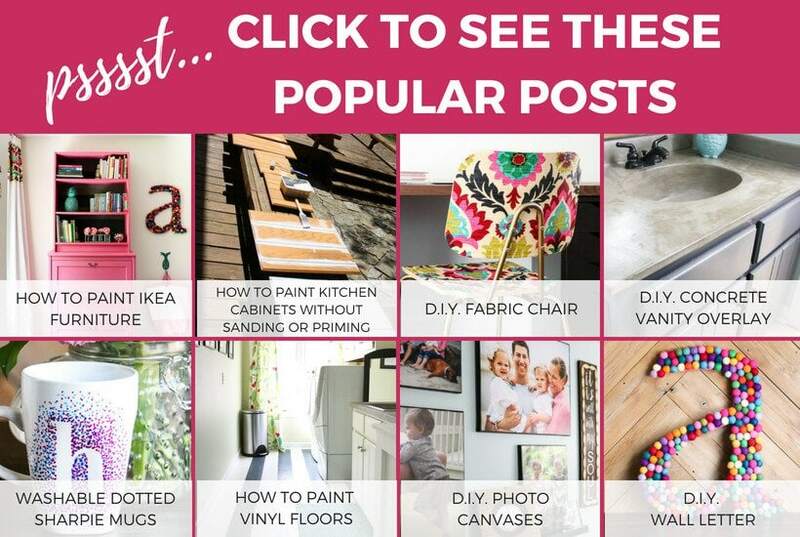 Before you head out and get started, be sure to check out my FREE design guides that will help you help you design spaces you absolutely love! Unlock my design vault and get access to all of them in one convenient digital library. Due to the volume of comments on some of my posts, we made the tough decision to disable comments after the first day a post goes live. But DON'T WORRY! If you have a question about this post, just click here to ask away on Instagram! Comment on my latest Instagram photo OR send me a direct message. If you aren't on Instsagram, feel free to email your question to [email protected], but know it will take us longer to get back to you that way. We appreciate your patience as we get tons and tons of questions from readers every single day. 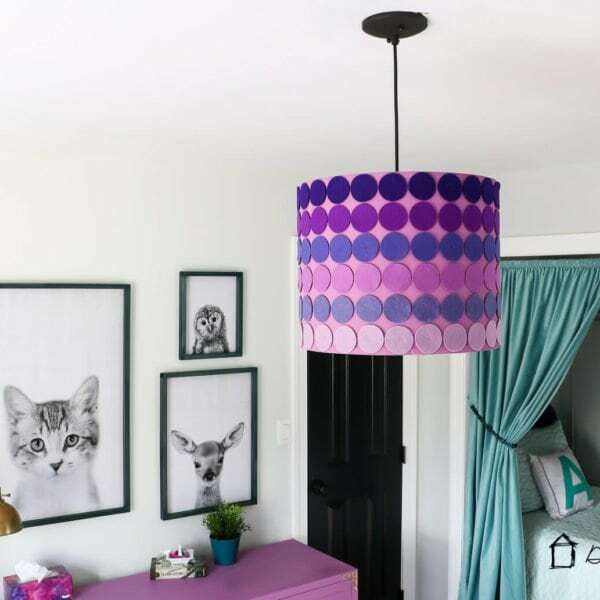 DIY Lampshade – Ombre Style!